You'll find plenty of places to visit near Rovaniemi: Korouoma Canyon (in Posio), Pyha-Luosto National Park (in Pyhatunturi) and Pyhatunturi (in Pelkosenniemi). On the 26th (Fri), spend an exhilarating day on the slopes at Ski Resort Ritavalkea. There's still lots to do: get in on the family fun at Santa Claus Village, explore the different monuments and memorials at German Soldier s Cemetery, admire the sheer force of Auttikongas, and make a trip to Santa Claus Office. For where to stay, ratings, traveler tips, and other tourist information, read our Rovaniemi tour itinerary maker tool . Copenhagen, Denmark to Rovaniemi is an approximately 7-hour flight. You can also do a combination of train and flight; or drive. Due to the time zone difference, you'll lose 1 hour traveling from Copenhagen to Rovaniemi. Expect a bit cooler temperatures when traveling from Copenhagen in April; daily highs in Rovaniemi reach 3°C and lows reach -3°C. Finish your sightseeing early on the 28th (Sun) to allow enough time to take a train to Oulu. Oulu is a city and municipality of inhabitants in the region of Northern Ostrobothnia, Finland. Change things up with these side-trips from Oulu: Sampo Icebreaker (in Kemi), Kierikki Stone Age Centre (in Yli-Ii) and Raahe Museum (in Raahe). On the 4th (Sat), ski the day away in the pristine settings at Syote Ski & Nature Resort. 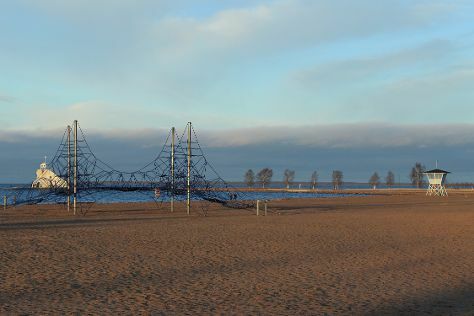 The adventure continues: stroll through Ainolan Puisto, enjoy some diversion at Tietomaa, have some family-friendly fun at Hoplop, and enjoy the sand and surf at Nallikari Beach. To find where to stay, traveler tips, maps, and more tourist information, you can read our Oulu driving holiday planner. You can take a train from Rovaniemi to Oulu in 2.5 hours. Alternatively, you can take a bus; or drive. In April, daytime highs in Oulu are 5°C, while nighttime lows are -3°C. Cap off your sightseeing on the 5th (Sun) early enough to travel to Helsinki. Explore Helsinki's surroundings by going to Teijo national park (in Pernio), Espoo (Nuuksio National Park & Arctic Expedition) and Sipoonkorven Kansallispuisto (in Vantaa). Pack the 9th (Thu) with family-friendly diversions at Linnanmaki Amusement Park. Next up on the itinerary: deepen your knowledge of military history at Sea Fortress Suomenlinna, don't miss a visit to Senate Square, take an in-depth tour of Seurasaari Island and Open-Air Museum, and appreciate the extensive heritage of The Esplanadi Park. To see maps, other places to visit, more things to do, and more tourist information, use the Helsinki sightseeing planner . Traveling by flight from Oulu to Helsinki takes 3.5 hours. Alternatively, you can take a train; or drive. When traveling from Oulu in May, plan for a bit warmer days and about the same nights in Helsinki: temperatures range from 18°C by day to 7°C at night. Finish up your sightseeing early on the 16th (Thu) so you can travel back home.